Stretches of remote, rarely crowded beaches and a string of beautiful barrier islands characterize North Carolina's coast. However, those looking for busier beaches will enjoy the several beaches near the more developed areas such as Kitty Hawk and Nags Head, NC. The lighthouses along the coast are some of the most beautiful and romantic in the country and many can be toured. Here are the best North Carolina beaches. Cape Hatteras National Seashore, one of the best NC beaches, is a portion of the Outer Banks that is preserved by the U.S. National Park Service. 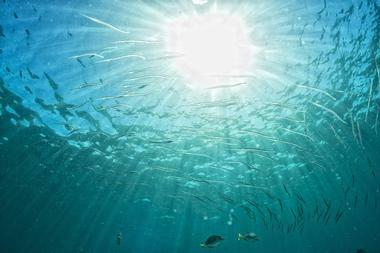 The more than 70 miles of protected seashore runs from Ocracoke Island to Bodie Island. There are three visitor centers that provide information, programming, and gift shops. The visitor center closest to Cape Hatteras Lighthouse includes the Museum of the Sea. This museum displays exhibits related to maritime history, the Outer Banks, the lighthouse, as well as the keeper’s quarters. The museum also displays artifacts from the many shipwrecks that lie off the coast. 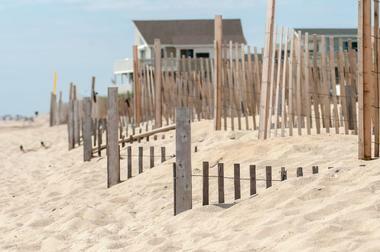 Four campgrounds are located along the seashore for visitors who are interested in spending the night. Wrightsville Beach is made up of two islands easily accessible from North Carolina’s mainland. The islands offer everything you need for a relaxing vacation, including plenty of accommodation options ranging from full service resorts to more budget-friendly hotels. Activities on the water include kayaking, paddleboarding, surfing, and fishing. Several boat companies offer evening harbor cruises. Beyond the beaches, visitors can bike the Wrightsville Beach Loop Trail or explore the town on foot. Shopping options include surf shops, open-air villages, and boutiques. Wrightsville Beach is home to the annual PPD Ironman NC, which is one of the top-rated triathlons in the world. Wrightsville Beach is one of the best North Carolina beaches and it's the closest beach to Charlotte, NC. Nags Head is one of the more developed areas on the Outer Banks. Here, visitors can experience the natural beauty of the Outer Banks yet still have easy access to amenities such as restaurants, mini golf, and shopping. 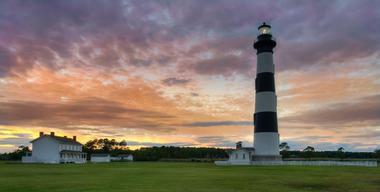 The Bodie Island Lighthouse is not far from Nags Head, and visitors can climb to the top during the summer. The historical Jennette’s Pier is located nearby as well. The pier offers a good location to fish as well as a small, kid-friendly museum. One of the most popular attractions in Nags Head is Jockey’s Ridge State Park, which is a popular place for hang-gliding, sand-castle-building contests, and scenic hikes. Keep reading for more vacation ideas on the North Carolina coast. 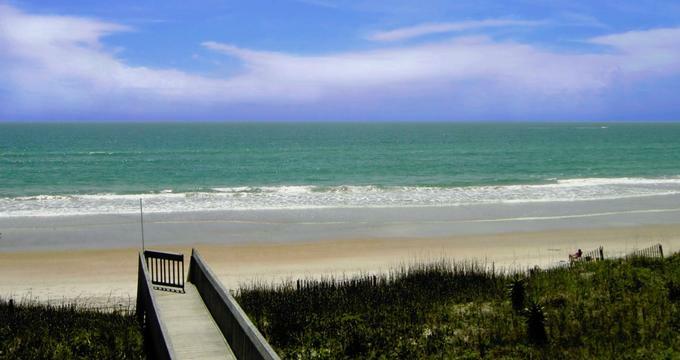 Topsail Beach stretches from the town limits of Surf City to the southern end of the island. The well-known Karen Beasley Sea Turtle Rescue and Rehabilitation Center is located at Topsail. The center cares for sea turtles who have been injured or who are sick. The Missiles & More Museum contains exhibits related to the history of the island, including exhibits on pirates and military history. The island has many beach houses for rent and retains the laid-back feel that is common in the Outer Banks and barrier islands. Boat rentals are available as well as numerous beach access points. Kure Beach is a beach on the Bogue Banks that features a beautiful setting, a relaxed atmosphere, and just the right amount of development to provide visitors with a comfortable vacation. The oldest fishing pier on the Atlantic coast juts out into the ocean and is a popular attraction in itself, whether you are walking along the pier to take in the sights or hoping to reel in a big catch. The North Carolina Aquarium is located nearby, as are many restaurants and shops. During the holidays, Kure Beach and the Bogue Banks are home to the Island of Lights Festival, which features a Christmas Flotilla and a tour of the area’s beautiful homes. Currituck Beach is clean, quiet, and serene but is still close enough to town to offer plenty of things to do. The area is famous for being home to wild Spanish mustangs, and several companies offer wild horse tours for visitors who would like to ride and see the horses in person. The Currituck Beach Lighthouse in Corolla is an interesting, Gothic Revival lighthouse and is on the National Register of Historic Places. 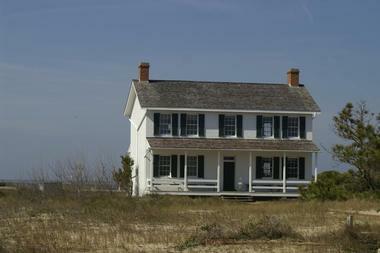 Visitors can tour the lighthouse seasonally, and the property contains a museum store. The nearby Currituck Banks Reserve is a preserved natural area where visitors can hike, fish, hunt, and more. Keep reading for more vacation spots on the North Carolina coast. Carova Beach is a remote stretch of shoreline in the northernmost part of the Outer Banks. The beach is only accessible by boat or 4WD vehicle along a paved road from Corolla. Wild horses can be spotted roaming freely on the beaches here. There are no shops, restaurants, or any other attractions; development is limited to beach homes and a rescue station. Popular ways to spend time at Carova Beach include sailing, windsurfing, and kiteboarding. The area is also a popular spot for fishing. The nearby town of Corolla offers restaurants, shops, and attractions such as the Corolla Wild Horse Museum. This museum is located in a historical schoolhouse that features informative and interactive exhibits about wild horses. Keep reading for more North Carolina beaches and find the closest beach near me. Ocracoke Island is home to 16 miles of undeveloped ‘wild’ beaches. The entire shore is part of the Cape Hatteras National Seashore. Ocracoke attracts visitors who are looking for relaxing, wide-open spaces to enjoy such activities as surfing, flying kites, sunbathing, boogie-boarding, and building sandcastles. The beach and surrounding areas are home to many birds, fish, turtles, and other wildlife. Birdwatchers come to see the more than 400 species of birds that can be found on Ocracoke. 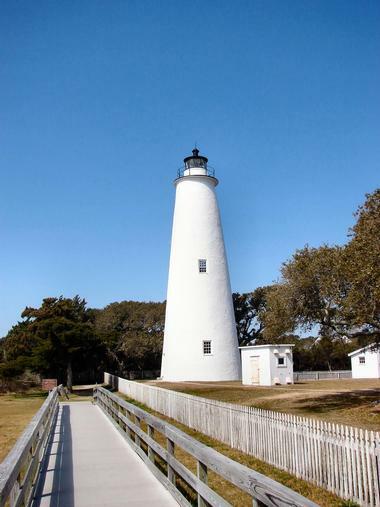 The Ocracoke Lighthouse is one of the most popular attractions on the island. The lighthouse is still active and visitors can tour the grounds. Ocracoke Island is accessible by ferry, and several ferries make the trip daily. Oak Island is a family-friendly beach destination in the Brunswick Islands. The laid-back barrier island provides the perfect mix of an easy-going, peaceful time at the beach and amenities such as marinas, mini golf, and bike rentals. Access the beach at more than 60 public access points or take a chance at reeling in a big one at one of the area’s fishing piers. Guests can get out on the water at Oak Island’s two marinas and three public boat and canoe ramps. 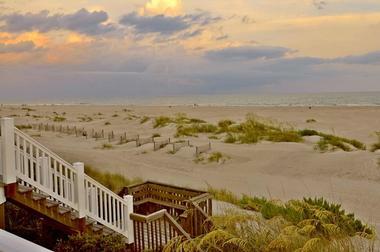 The 10-mile stretch of sand is perfect for unwinding and enjoying everything one expects from a North Carolina beach. Pea Island National Wildlife Refuge, aptly named because of its small size, is a protected wildlife refuge located on a barrier island in the Outer Banks. The refuge exists to protect and provide a habitat for migratory birds. Animals that can be seen in the park include the greater snow goose and many other waterfowl, wading birds, raptors as well as endangered species such as the loggerhead sea turtle. The refuge’s visitor center is located on Roanoke Island and features exhibits related to local wildlife, birds, and more. There are several trails in the refuge that can be used by visitors for birdwatching, hiking, wildlife photography, and fishing. Hammocks Beach State Park is a state park along the southern Outer Banks that is made up of Bear Island, three smaller islands (Dudley, Huggins, and Johns), and 319 acres on the mainland. Bear Island is the main attraction at the park and is a 3-mile-long barrier island that is accessible by park ferry, private ferry, or by paddling a canoe or kayak. The park’s beaches are wide with massive dunes and primitive campsites. The only semblance of development is a basic concession and picnic complex. The mainland section of the park houses a full-service visitor center that provides visitors with access to the ferry as well as a launch site for rented or personal canoes. The visitor center also has exhibits and interpretive programs that teach visitors about the natural environment of the park and the park’s varied wildlife. 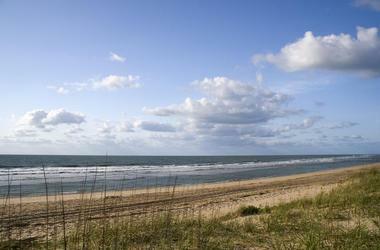 Holden Beach is an 8-mile stretch of sand on a barrier island off the North Carolina coast. The Intracoastal Waterway separates the islands from the mainland. Visitors can canoe or kayak the waterway and perhaps catch a glimpse of the endangered loggerhead sea turtles that frequent the area. Shrimp boats travel up and down the waterway as they enter and leave the open ocean, which can be an interesting sight. Visitors can spot dolphins playing in the surf during the day and ghost crabs in the sand by flashlight at night. The annual North Carolina Festival by the Sea is a popular event featuring handicrafts and delicious food. Keep reading for more North Carolina beaches. Frisco Beach is located on the southern tip of Hatteras Island. The beach features a slowly sloping ocean floor, making it ideal for swimming because there are no drop-offs. This quiet escape is perfect for visitors who want to relax and enjoy the beach. The town has a few small restaurants and convenience stores. Accommodations in Frisco range from vacation rental homes of all sizes to campgrounds. Two of the most popular campgrounds on Hatteras Island are located in Frisco, including the National Park Service campground and the Frisco Woods Campground, which features private campsites, a swimming pool, and a small convenience store. Frisco has a go-cart track, a mini golf course, and a company that offers flight tours. Canadian Hole is one of the most popular Pamlico Sound side beaches on Hatteras Island. Albeit a rather strangely named beach, Canadian Hole has long been well known among water sports aficionados. The sound has some of the best wind and water conditions, attracting fans of windsurfing, stand-up paddleboarding, and kiteboarding all year round. The beach is also popular with young families, who enjoy the quiet waters. The water is shallow for several hundred feet out into the sound and is virtually always calm. The sunset is amazing over the sound, with views of Hatteras Lighthouse in the distance. Keep reading for more amazing places to see on the North Carolina coast. North Carolina’s Outer Banks are full of hidden treasures like Salvo Beach. The town doesn’t offer much in the way of shopping or amenities, but it does provide the perfect place to relax and unwind without the distractions of some of the busier Outer Banks beaches. Most of the accommodation consists of rental homes. The Salvo Day Use Area is a popular destination for kiteboarding and other water sports. This public park is part of the National Park Service and features sandy beaches and perfect access for water sports. The Pamlico Sound is shallow and calm near the shore, which makes it perfect for families with young children. Coquina Beach is part of the Cape Hatteras National Seashore. The beach is completely undeveloped but is located close enough to the well-developed towns of Nags Head and Kitty Hawk, where visitors can find services and restaurants if desired. The beach is accessible only by foot or 4WD vehicle. The beach is the location of the shipwreck Laura Barnes from 1921, and a few pieces of the ship still remain. 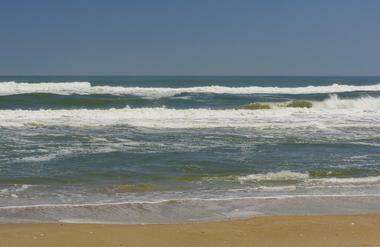 Coquina Beach is a popular location along the Outer Banks for surf fishing, which is at its best in the spring or fall. 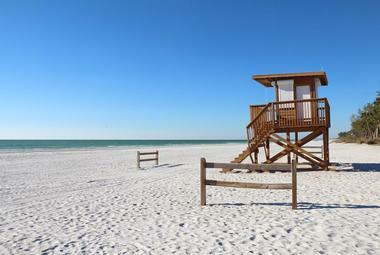 Coquina is the perfect place for a quiet, relaxing beach trip not too far off the beaten path. 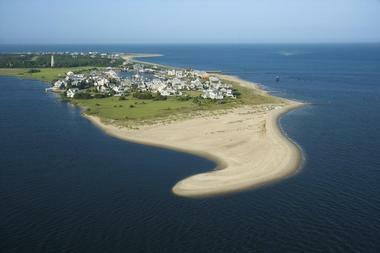 Bald Head Island is a small, remote village located on the east side of the Cape Fear River. It is only accessible by ferry from Southport and the island has very few cars. Most of the residents drive golf carts or pedal bicycles around. The island is famous for the sea turtles that nest here and Cape Fear Point is a popular attraction. It is here that the Frying Pan Shoals extend out into the ocean for 30 miles. These sand bars seem to rise up from underwater and descend back as the tide ebbs and flows. In addition to enjoying the picturesque beaches, popular activities on the island involve renting bikes to cycle around the island, taking hikes, and going on canoe and kayak tours. Carolina Beach offers a beach experience that makes visitors nostalgic for the North Carolina beach vacation of the past. This beach features a vintage boardwalk with live music, great fishing, and several events throughout the year. The boardwalk contains several restaurants, an ice cream store, and more. Rides and games are also set up along the boardwalk’s strip during the summer and the arcade and gift shops are open all year round. The nearby Carolina Beach State Park is a 761-acre park located along the Cape Fear River. The park’s amenities include miles of hiking trails, campsites, and a marina. The visitor center displays exhibits related to local and state natural history. Rare carnivorous plants like the Venus flytrap can be found in the park’s wetlands. Emerald Isle is part of the Crystal Coast located on the Bogue Banks. The oceanfront is filled with homes and a few condominiums, but there are no hotels on the beachfront, giving the beach a decidedly family-friendly feel. Popular outdoor activities on Emerald Isle are kayaking, paddleboarding, SCUBA diving, golfing, and more. The Bogue Inlet Fishing Pier is a popular place to try and test your luck with a rod and reel. The North Carolina Aquarium is not far away either, as it is located in Pine Knoll Shores. A plethora of kid-friendly activities give families plenty of reasons to choose Emerald Isle as their next vacation spot. Fun places like Water Boggan of Emerald Isle, Playland in Emerald Isle, and Emerald Forest Putt-Putt will have your kids begging to come back year after year. Atlantic Beach is located on Bogue Banks, one of North Carolina’s barrier islands, which is separated from the mainland by the Bogue Sound. The island can be reached via one of two bridges across the sound. Most accommodations on the beach are private homes. The North Carolina Aquarium is located in the center of the island and is a popular attraction. Atlantic Beach has a wide range of dining options that should satisfy any visitor. From ice cream shops and snack shacks to sit-down, full-service restaurants, everyone should find something they like. Shopping opportunities include several surf shops and local beach boutiques. The remote barrier islands that make up the Cape Lookout National Seashore are located three miles offshore and are accessible by ferry. The visitor center on Harkers Island displays exhibits about the history of the island, the Cape Lookout Light Station, and more. A film is shown several times daily, and there are nature trails nearby. Visitors can climb the lighthouse itself and visit the keeper’s quarters. Shackleford Banks is a popular place for swimming and enjoying the beach as well as searching for the area’s wild horses. Visitors can camp in a tent or stay at a cabin in the park. Another exciting way to experience the seashore is by visiting several of the islands on a multi-day canoe or kayak trip. The Brunswick Islands comprise six separate island communities that are located on five barrier islands off the coast of North Carolina. The area includes something for every type of vacationer and every budget. The islands have many coastal towns with a variety of amenities and attractions. A wide variety of restaurants are available, whether you are looking for a quick bite or a relaxing dinner. You don’t have to travel far to find world-class golf courses, fantastic dining, and a wide range of shopping. 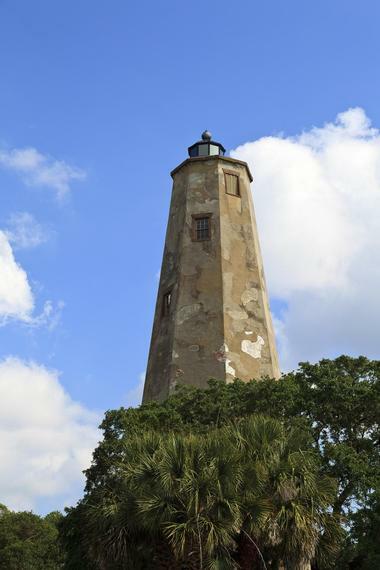 The Brunswick Islands are home to both the oldest and newest lighthouses in North Carolina and both are interesting and scenic places to visit. 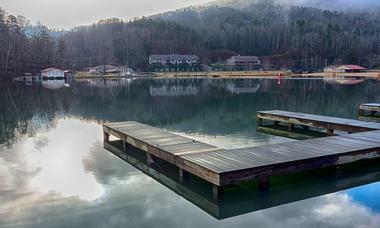 Lake Lure is a man-made freshwater lake on the Broad River. Nestled in the beautiful Blue Ridge Mountains, the lake has an area of approximately 720 acres with 27 miles of shoreline. Visitors can relax on the sandy beach, have a picnic, and swim or float in the water. Lake Lure Beach is perfect for families and includes a water park that has a water slide and even encourages friendly water fights. The beach house at Lake Lure sells several necessities and comfort items for enjoying a day at the beach, including towels, chairs, sunscreen, and water toys.